The Real-Time Governance Centre at the state Secretariat announced that 'Phethai' weakened into a cyclone as it made landfall near Katrenikona today afternoon with a wind speed of 80 kmph. Cyclone Phethai: An alert was sounded in all of Andhra Pradesh's nine coastal districts. 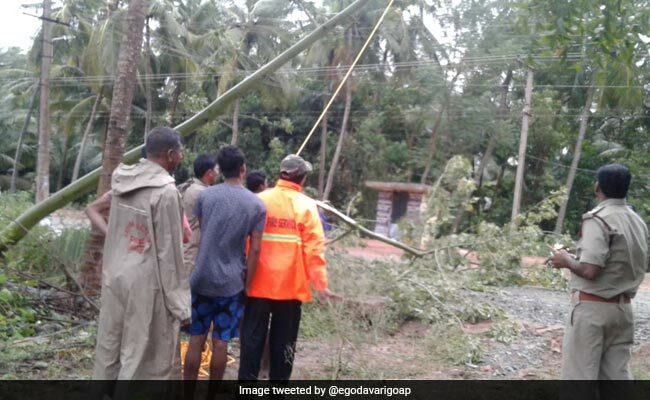 Cyclone Phethai made a landfall at Katrenikona in the East Godavari district of Andhra Pradesh on Monday. 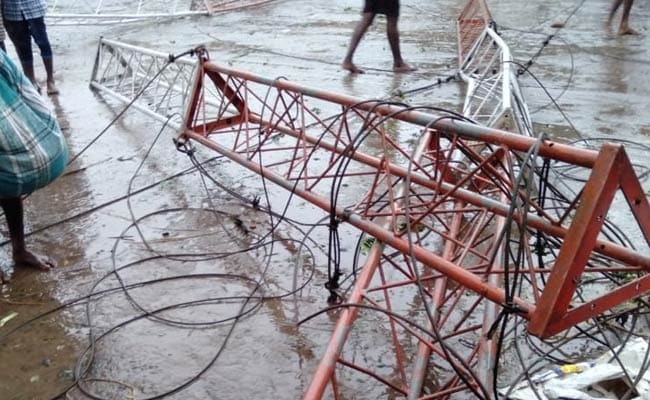 The Real-Time Governance Centre at the state Secretariat announced that 'Phethai' weakened into a cyclone as it made landfall near Katrenikona today afternoon with a wind speed of 80 kmph. The South Central Railway cancelled over 50 trains because of Cyclone Phethai. The national and state disaster response forces were being kept on standby along with 10,000 state government employees as part of disaster preparedness. The Indian Navy, through the Eastern Naval Command, for the past two days had flown 11 sorties across the eastern coast and broadcast warnings to fishermen to stay away from the coastline. Several flights were also cancelled to the port city of Visakhapatnam due to turbulent weather conditions. Some flights were diverted to Hyderabad. Special trains are running between Secunderabad and Kakinada in Andhra Pradesh amid Cyclone Phethai. 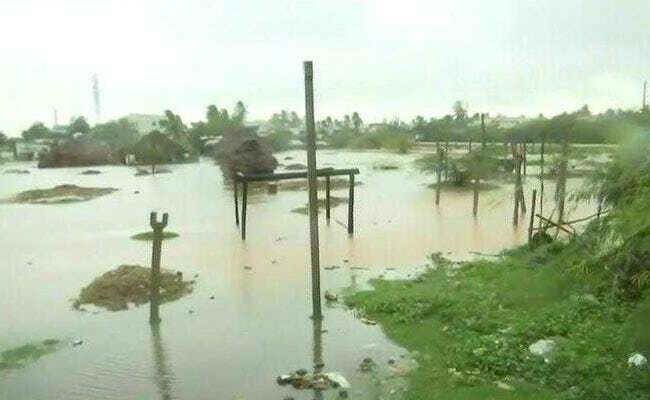 The East Godavari district of Andhra Pradesh bore the brunt of Cyclone Phethai as it made landfall near Katrenikona today afternoon, forcing the evacuation of 20,000 people, who are being sheltered in relief camps. 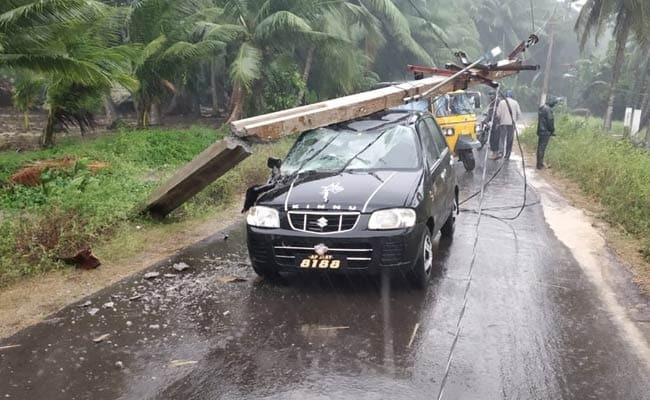 Strong winds reaching up to 85-90 kmph uprooted electric poles and trees in Katrenikona, Tallarevu and Malkipuram in East Godavari, disrupting power supply. Incessant rains in Raipur due to Cyclone Phethai have led to a change in the venue of the swearing-in ceremony of the new chief minister of the state. The oath taking ceremony of Congress leader Bhupesh Baghel as the new Chhattisgarh chief minister has been shifted from the Science College grounds to Balbeer Juneja Indoor Stadium in Raipur because of the rainfall, a Met official told news agency PTI. According to the weather department, Cyclone Phethai has affected the weather of Chhattisgarh that has resulted in rainfall in Raipur. A Met official said that Chhattisgarh is likely to see light to moderate rainfall over a few places in next 48 hours. Visuals from coastal areas of Andhra Pradesh affected by Cyclone Phethai. 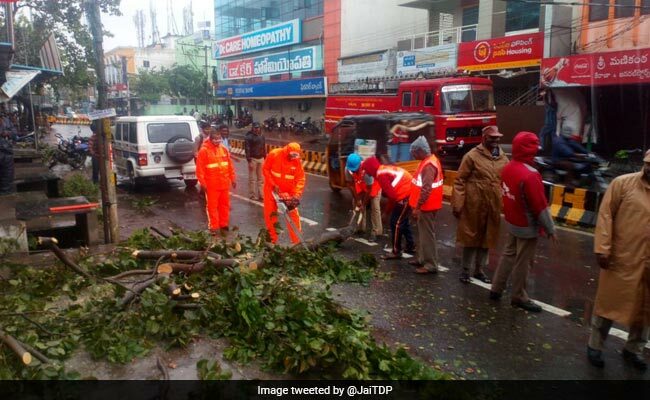 The disaster teams deployed by the Telugu Desam Party-led government can be seen clearing uprooted trees and debris caused due to the cyclone. 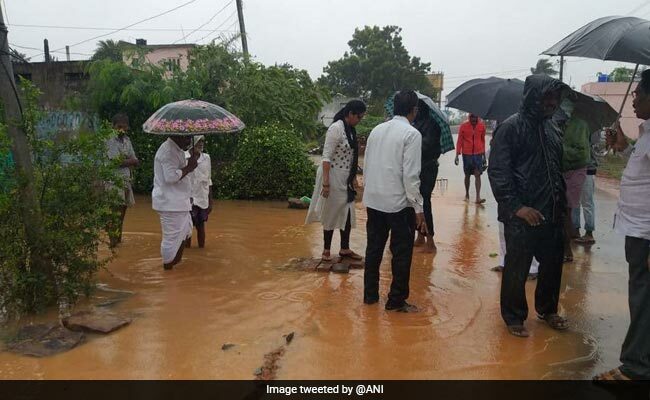 Visuals from Kakinada city in Andhra Pradesh as Cyclone Phethai hits the Kakinada coastal area. One person was killed in a landslide caused by heavy rains in Vijayawada city, reports news agency PTI. The Real-Time Governance Centre at the state Secretariat announced that 'Phethai' weakened into a cyclone as it made landfall near Katrenikona around 12.25 pm with a wind speed of 80 kmph, reports news agency PTI. Several flights to Vizag have also been cancelled as severe cyclonic storm Phethai is set to make landfall today. The National Disaster Management Authority said that Cyclone Phethai is moving northwards with a speed of 23 km/per hour during the last 6 hours. 22 passenger trains have been cancelled as Cyclone Pethai is expected to make landfall between Visakhapatnam and Kakinada coasts today. Budget airlines IndiGo also issued travel advisory that the flight departures and arrivals are affected at Visakhapatnam airport. 100 cyclone shelters have been opened with 200 cooks being employed to prepare meals at relief centres. Bracing for Cyclone Phethai, 22 passenger trains have been cancelled, one rescheduled and one partially cancelled, news agency ANI reported. Cyclone Phethai is set to make landfall around Kakinada of East Godavari district in Andhra Pradesh today.